The Carleton Quiz Bowl team is one of the oldest continuously-running clubs in the country, having been active since the late 1980s. In recent years, we have sent teams to many regional tournaments in Minnesota, Iowa, and Illinois as well as national championship tournaments in Chicago, Dallas, Maryland, and Pittsburgh. Highlights of the program's history include undergraduate national championships in 1999 and 2007 and a Division II national championship in 2008. We invite all Carleton students to join the team, regardless of background or skill level. Playing in high school is not a requirement — indeed, some of our best players didn't play until arriving at Carleton. We practice twice a week (Monday and Wednesday nights, generally) and practices are open to all. In addition, we frequently send multiple teams to tournaments, so just about anyone who wants to can attend most tournaments. 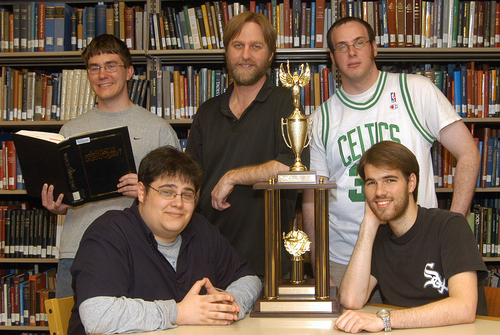 Read the thrilling story of the Carleton Quiz Team’s 2007 National Title triumph.